The Rolex Explorer II is a robust and reliable tool watch. Its additional 24-hour hand can be used to display a second time zone or as a day/night display. Its design means it is easy to read at a glance. 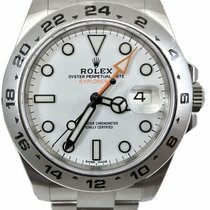 The Explorer II is a member of Rolex's Oyster Perpetual family. The manufacturer designed the watch with a specific group of explorers and scientists in mind. When the Explorer II premiered in 1971, it was the perfect tool for spelunkers. Spending long hours in underground labyrinths without any sunlight can cause you to lose a sense of whether it's night or day. Regular watches, whose hour hands don't distinguish between AM and PM, aren't much help in this situation. This can be a problem in polar regions during the winter as well, as the sunless polar night can be disorienting. Rolex developed a watch to solve this exact problem. The Explorer II has an additional hour hand that makes one full rotation a day and works in combination with a fixed 24-hour bezel. 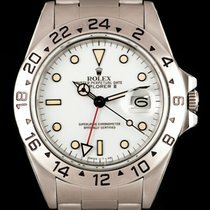 The GMT-Master II also features a second hour hand, but has a rotating bezel. The rotating bezel makes it more appropriate for travel across different time zones. However, because the extra hour hand can be set separately in both models, the Explorer II can also display the time in another time zone. 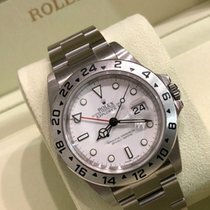 How much is a Rolex Explorer II? Vintage Explorer II models with the reference number 1655 are especially highly sought-after. Known among watch fans as "Steve McQueen" or "Freccione" , this line was part of Rolex's catalog from 1971 to 1975 and differentiates itself from later models mainly in its dial and bezel design. It has printed line indices on the dial, and the numerals on the bezel are markedly thinner than those found on the models that followed. What's more, the numerals on earlier models were separated by triangles, which were replaced by lines on later models. This watch also lacks the Mercedes hands that are so common today, and its orange glow-in-the-dark 24-hour hand has a large, arrow-shaped tip. Depending on the year of production, this timepiece is powered by either the caliber 1570 or 1575. Expect prices of around 43,900 USD for a never-worn ref. 1655. Pre-owned models cost an average of 20,400 USD. Its successor model, the ref. 16550, is also quite popular. It was with this watch that Rolex first introduced the round applied hour markers we still see today. Those on the 16550 were white gold and filled with luminous material. The indices at 6 and 9 o'clock were bar-shaped, while the 12 o'clock marker was an upside down triangle. Sapphire glass, Mercedes hands, and a red 24-hour hand with a thinner arrow tip were also new to this timepiece. 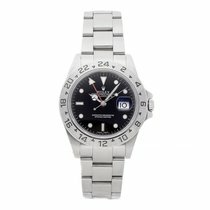 Furthermore, it was the first Explorer II to come with the option of a black or white dial. The caliber 3085 ticks away in both Explorer II and GMT-Master pieces from this time period. Over time, the dials on the white editions have turned more ivory in color. These are referred to as "cream dials" and are especially coveted by collectors. Prices for never-worn pieces start around 22,300 USD. On the other hand, you can get a pre-owned model with a black dial for as little as 9,500 USD. The ref. 16570 followed in 1989 and was almost identical to its predecessors. Models with white dials featured indices trimmed in black as well as black hands. The caliber 3185 powered these watches until 2007 when it was replaced by the 3186. You can recognize later models by their lugs, which were no longer drilled through, and by the Rolex engraving on the rehaut. 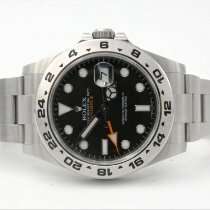 Plan to spend about 5,600 USD on a pre-owned Explorer II ref. 16570. Never-worn models demand an additional 1,900 USD. The Explorer II experienced its biggest update with the introduction of the ref. 216570 in 2011. Its stainless steel case is 42 mm in diameter and feels significantly heftier. This model was given a maxi dial with enlarged glow-in-the-dark indices and marked a return to the large orange arrow-shaped 24-hour hand found on the original model. Its movement was also overhauled. The caliber 3187 now powers this timepiece. It features an anti-magnetic blue Parachrom hairspring and the Paraflex shock protection system. These watches cost 7,900 USD new. You can save a few hundred euros if you purchase a pre-owned model. 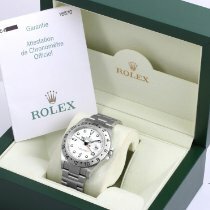 Rolex uses the caliber 3187 in the current generation models with reference number 216570. This automatic movement beats at 28,800 alternations per hour (4 Hz) and has a 48-hour power reserve. This is truly a high-precision movement. It deviates from the reference time by a maximum of only two seconds a day. The caliber is COSC-certified, meaning the Official Swiss Chronometer Testing Institute (COSC) tested the caliber's accuracy and awarded it a certificate confirming its high performance. The 3187 is derived from the 3135, a movement that is used in a number of Rolex watches, including the diving watch Sea-Dweller Deepsea. The 3187 features a blue Parachrom hairspring. Rolex introduced this important balance wheel component in 2005 after a five-year period of development. The hairspring is made of an anti-magnetic zirconium-niobium alloy and is ten times less affected by jolts than regular hairsprings. The Explorer II is even more protected, though, as its Paraflex shock protection system shields it from shocks and extreme conditions. When used as intended, the 24-hour display on the Explorer II functions as follows: At 6 AM, the extra hour hand is at the three o'clock position, pointing to the six on the bezel. At noon, it's at the six o'clock position, which corresponds to 12 on the bezel. At the beginning of the evening at 6 PM, the hand moves to the nine o'clock position, corresponding to 18 on the bezel. Six hours later at midnight, the hour hand reaches the final point of its full rotation: the 12 o'clock position corresponding to 24 on the bezel. Both the case and three-piece link bracelet on the Explorer II are made of 904L stainless steel. This type of steel is especially corrosion and scratch resistant. The practical Oysterlock clasp has been part of the bracelet since the ref. 216570. Thanks to its Easylink extension system, extending the bracelet by 5 mm couldn't be simpler. This is especially useful when you are exercising or in warm temperatures, as the wrist can swell slightly. The screw-down Twinlock crown is equipped with two gaskets to protect it against water and dirt. The gasket system and the screw-down case back ensure waterproofness to a depth of 100 m (10 bar, 328 ft). Thus, you can wear your Explorer II while swimming and snorkeling without any problems. The dial is available in two colors: black or white. The hour indices are available exclusively as symbols instead of numerals. The eight circles, two lines, and triangle at 12 o'clock are filled with a luminescent material, Chromalight, which emits a blue glow. Even the hands are filled with Chromalight. Other manufacturers use Superluminova, which glows green. 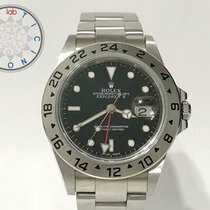 Rolex previously used Superluminova, but have discontinued their use of it. Scratch-resistant sapphire glass protects the dial from above. A magnifying Cyclops lens sits atop the date display at 3 o'clock. This lens is a hallmark of a number of other Rolex models, including the Submariner.